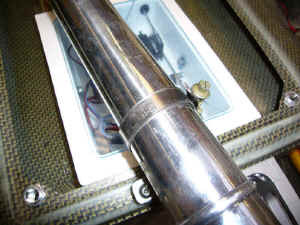 Sparkplug to transom with Tiger King or Zenoah should be close to 540mm (transom is the vertical part of the back of the boat).Use a rudder with a 100mm bracket. CG without fuel 440mm. Fuel tank is between engine and radio box. Strut centre height about 12 to 15mm. Dimension A 12 to 15mm to start with. 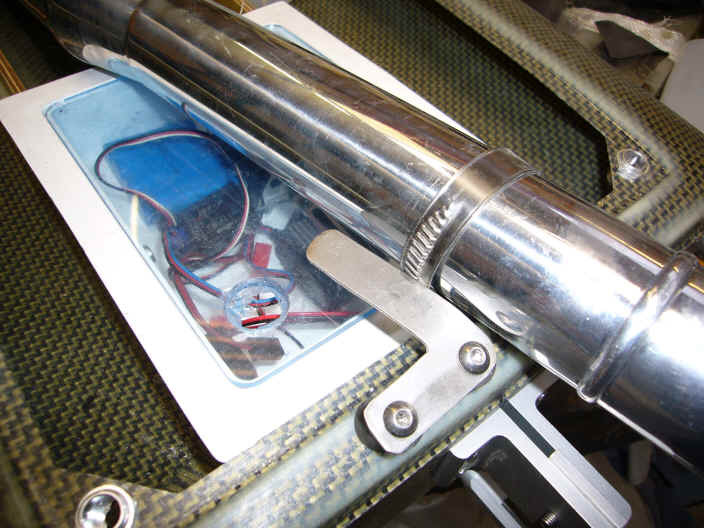 Balance point of 440mm from the transom without fuel is critical. Do not be afraid to add some weight to the front of the boat to achieve this. Sparkplug to transom with Tiger King or Zenoah should be close to 540mm (transom is the vertical part of the back of the boat). Fit the engine to the complete rubber mount assembly and position it where shown but do not fix in place yet. 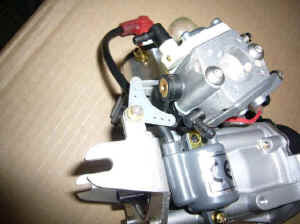 Remove the pullstart from the motor and remove the 3 countersunk screws which fix the big aluminium plate to the motor. The screws may be tough to remove. Take out both screws from the red coil and loosely fit the coil relocator using the same screws. Turn the flywheel until the magnets are on the opposite side to the coil ( magnets are the shiny metal parts on the outside of the flywheel). 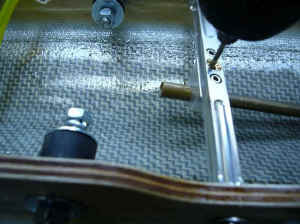 Push the coil away from the flywheel and put a piece of thin card between the coil and flwheel. Press down on the red coil and tighten the 2 screws and then remove the cardboard. This will set the correct airgap between the coil and flywheel. Fix the motor mount brackets to the engine and fit the throttle bellcrank and/or bracket to the front of the motor as shown in the pictures. Fit the pullstart using the M4 screws in the motor mount kit. Before fitting the pullstart make sure the screws do not bottom out. If they do then use some shorter screws or washers under the heads of the bolts. Bolt the rubbers to the brackets using the nuts and washers provided. The motor mount and rubbers will then fit between the wooden rails. Fit the coupling to the motor. The strut and rudder should now be mounted on the transom of the boat in the position shown in the drawing and picture. Use 50mm wide masking tape to cover the transom. This will allow you to mark the screw positions etc. Drill a hole for the proptube in the ‘V’ of the transom and elongate it upwards with a file so that the strut height can be varied. 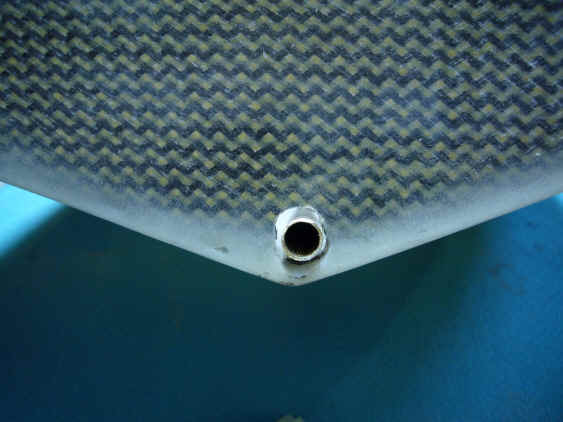 After first tests to find the best strut height/propeller the tube exit through the transom can be with silicone sealer although many people leave this hole open. Mark and drill the screw holes for the rudder and strut. Fit the tube is the next job . The tube should run along inside the bottom of the boat and it should make a gentle curve up to the motor. The tube will bend without kinking if bent carefully. Cut the prop tube to length so that it is about 10 to 15mm from the coupling but pushed into the strut as far as possible. 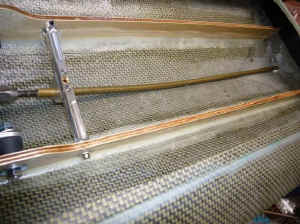 The tube should run along the bottom of the hull from the transom and then be curved upward to slide into the coupling. The front end of the tube near the engine must be supported with a T-bar and the short piece of brass tube that fits over the long tube should be epoxied into the bottom of the boat at about mid position. The end of strut or stinger should be between 65mm and 100mm. We like to run it between 65 to 80mm but its not critical on the Stratos. 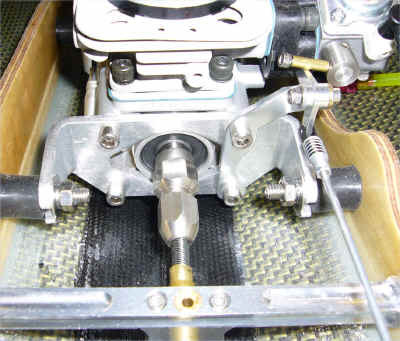 The front end of the tube near the engine must be supported by the T- bar as shown in the pics. 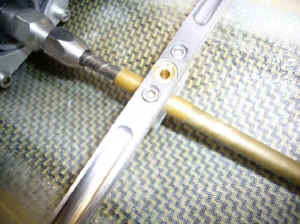 Cut the flexi to length, remembering to leave a gap of 5 to 6mm (not less than 5mm) between thrust washer and the strut. Do not cut the flexi too short, because it has to go inside the coupling as far as possible. 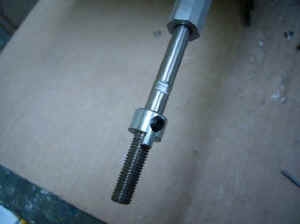 When the collet coupling is tightened onto the shaft, use a lot of force. 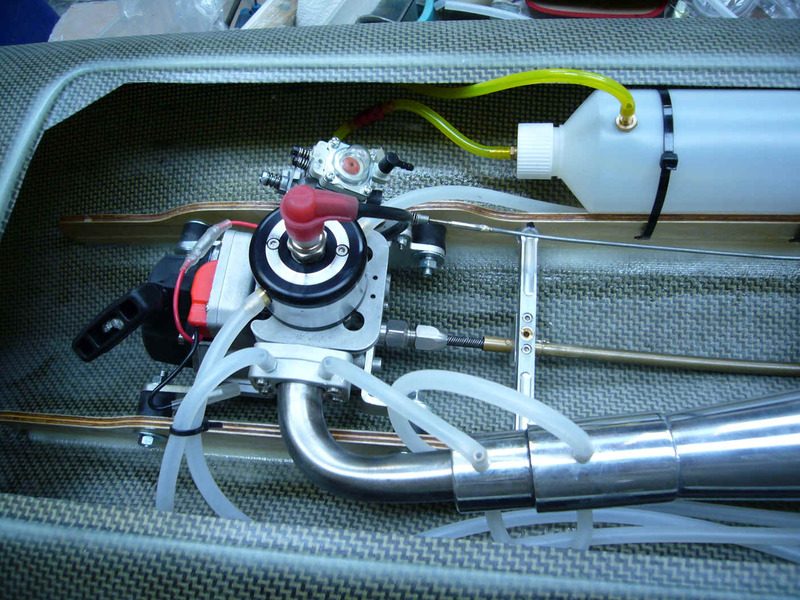 The fuel tank is designed to be fitted between engine and radio box. 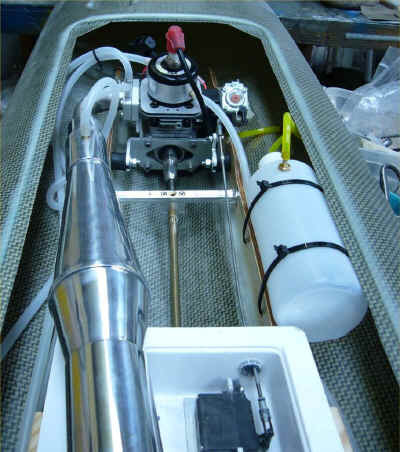 Racers will have their own ideas but keep the tank as far back as possible in the boat. 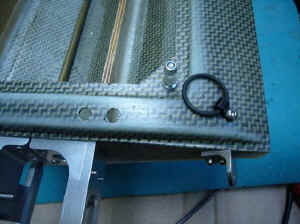 Fix the hatch down using GA8 hatch fasteners or similar at the rear, We also usually use oring type fasteners near the front. 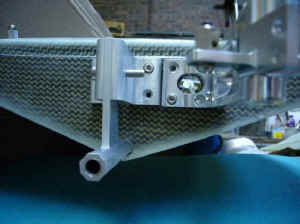 At the front of the hatch, trim the projecting part so that it slides easily under the deck. This part may need reinforcing with glass cloth and epoxy. The radio box can be fibreglassed in place or fixed to the rails with brackets. Take care to seal any holes in the radio box with cyano, epoxy or silicone (preferably cyano or epoxy). 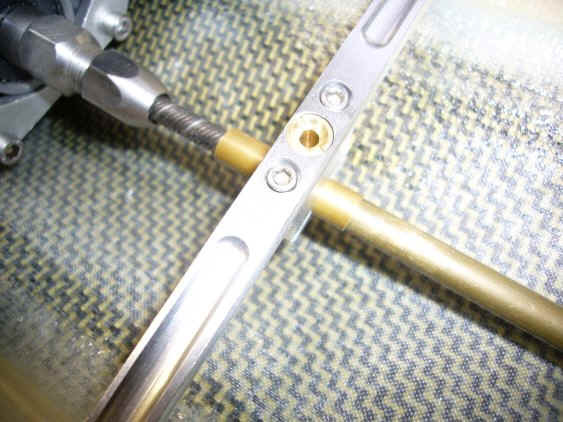 A standard size metal geared high torque rudder servo of at least 15kg torque should be fitted for operating the rudder. 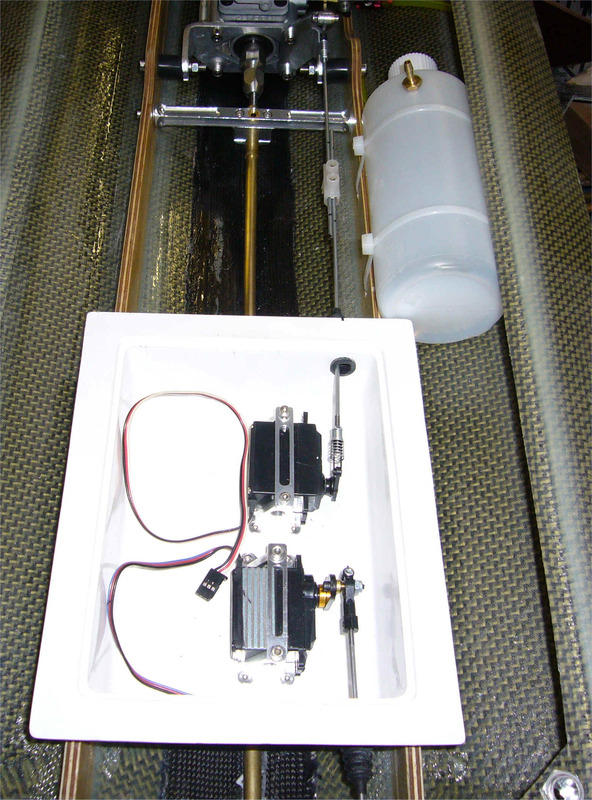 The throttle servo can be any standard or high speed standard size. Use a 5 cell Nimh or 2 cell LIFE pack for the receiver. Turn fins should be fitted at 90 degrees to the hull bottom on each side as close to the outside edge as possible. 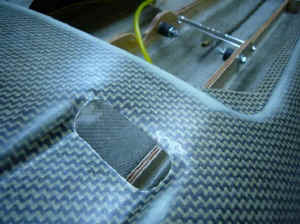 Make sure the brackets and turn fin are very strong. Movement in this area will affect the turning of the hull. 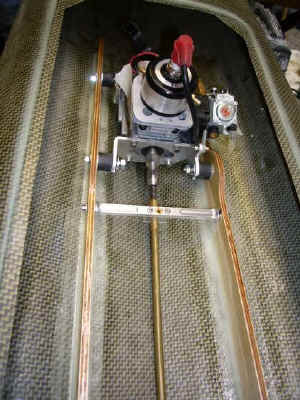 The trim of the hull can be altered by trim tabs, strut height or angle and rudder position. The boat will be fastest with a strut but a stinger can be used. 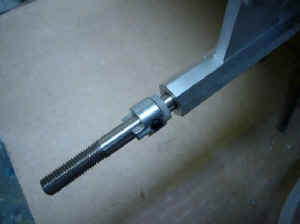 The flexi shaft MUST be removed and greased after every days running. Mercury Quicksilver grease is popular but any grease is sufficient. Only use balanced / sharpened propellers. Pipe length from exhaust flange on the engine to widest part of tuned pipe should be 330 to 345mm. Start at 345mm and shorten to get more rpm. To attain the highest speeds will take some time in adjustment of strut or stinger height and angle. IMPORTANT. When fitting the engine, t-bar and radio box. Make sure that the rails are not pulled in or pushed out when fixing these items between the rails. This can distort the hull. This is a common problem because our boats have very strong rails compared to other boats. Use spacers or washers if too loose or cut away part of the rails if necessary.